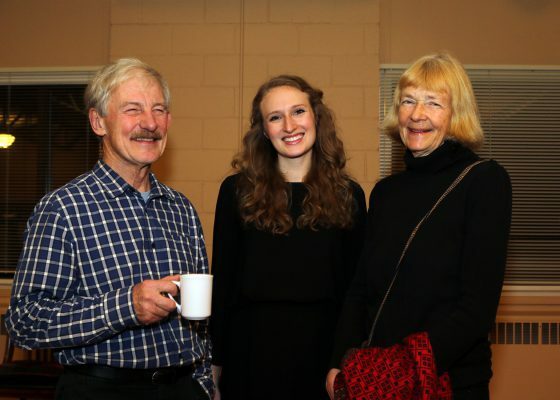 John Himmelman (left) and Helga Guderley (right) with cellist Kathleen de Caen (center) at a post-concert reception in January. Helga and John are both professors of Biology, recently retired from Laval University. In 2010, they moved to Nova Scotia, settling in Boutiliers Point. It wasn’t long after that they became regulars at the Cohn for concerts and eventually season subscribers and donors. Helga and John recently shared their thoughts on why they love and support the Symphony. Music was a part of Helga’s life from an early age as both her parents were musicians. John grew up in Bridgewater, Nova Scotia. John and Helga met in Vancouver when they were both working on their PhDs at UBC. Helga tells us that apparently, John used to listen to opera in the dorm. He had taped radio broadcasts from the Met and played them to his floor mates. Now that Helga and John have settled in Nova Scotia, music plays a big part in their lives here. They are delighted to have access to a wide range of cultural events: Capella Regalis, Kings Chapel Choir, Blue Engine String Quartet, Live Art Dance, Opera Nova Scotia, and Cecilia Society, and they are quick to note the contributions that Symphony musicians make to all of these. As generous donors, Helga and John have chosen to support the Symphony on an annual basis through the Musical Chairs program. Initially they became interested because they admired the work of Dominic Desautels, Principal Clarinet. They have clearly enjoyed the Musical Chairs receptions, getting to know Dominic and connecting with a number of other musicians throughout the season. They also understand the impact they are making in supporting the work of the orchestra. Helga believes it’s important that Symphony supporters are aware of where the money comes from.